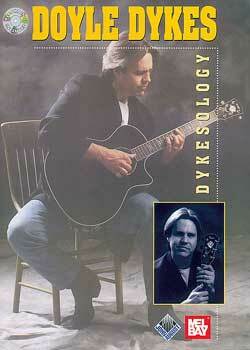 Doyle Dykes Dykesology PDF + Mp3 CD download. Dykesology for Guitar (Fingerpicking). Bluegrass & Country, intermediate. Book/CD Set. As one of the brightest stars in the world of fingerstyle guitar, Doyle Dykes breathes new lifer and considerable swing and soul into the genre. This book presents ten outstanding arrangements, offering a cross-section of Doyle’s music and a panorama of his career. Doyle engages his audiences with an astounding arsenal of right and left-hand techniques, sweeping them along on a musically satisfying, even spiritual flight. He is also an innovative and gifted arranger. This book contains pieces in standard and altered guitar tunings written in standard notation and tablature for the intermediate to advanced player. Includes performance notes by Jonathan Burchfield. The companion CD presents the artist’s sparkling renditions of each challenging selection in the book. Format: PDF + CD Mp3 tracks. Download Doyle Dykes – Dykesology PDF free and other books from our site. Only high quality PDF scans. Please write a review, it's important for our community.